Right ascension: 20h 24m 5s Declination: +38° 33' 0"
100x10s frames. Captured in K3, debayered in AVIRaw, stacked in Registax, curves in photoshop, slight noise reduction in NeatImage and upsized a small amount in photoshop. 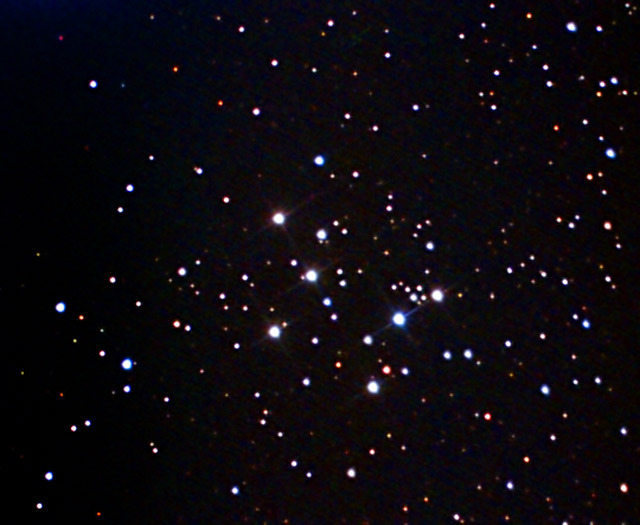 M29 is a fairly coarse open cluster in Cygnus around 7000 light years away. The arrangement of stars reminds one of the Big Dipper and, to me, the Pleiades. Images like this show the colours of the brighter stars clearly. These bright stars are around Mag. 8 to 9, too dim for the naked eye. This image was taken in twilight during an evening of moderate wind. The new observatory walls did a good job of keeping the scope steady.